Using digital technology effectively in schools requires profound changes in traditional teaching and learning activities. Pedagogical innovations often start small-scale and developing good ideas into shared practice across schools is challenging in many ways, especially if the innovation requires second-order change, i.e. challenges to fundamental beliefs about teaching and learning. This study investigates how a validated pedagogical method requiring integrated Information and Communication Technology (ICT) use and second-order change can be disseminated and sustained over time. We surveyed 92 primary school teachers who at different times over a 5-year period participated in a training course designed to implement an innovative technology-supported teaching method, Write To Learn, across an entire city. We found that organized teacher development programs can drive second-order change, but this requires considerable, active, and sustained effort from leaders at both school and district level. Additional factors include immediate and extended social systems and handling diversity among teachers. The results are useful for both practitioners and researchers since they contribute to a deeper understanding of the opportunities and challenges involved in disseminating effective ICT-based methods that requires profound changes of thinking about teaching and learning to guide the transformation of teaching practice. Information and communication technology (ICT) offers opportunities for the advancement and improvement of education (Makki et al. 2018) but in order to be effective – help provide better education – ICT needs to be integrated into teaching practices. This is a complex and time-consuming process that requires comprehensive efforts characterized by difficulties and frustration (Willermark 2018). The potential for technology to support and enhance learning in general has not yet delivered on the wish to transform the very learning- and teaching practices (Glover et al. 2016). Existing evidence-based successes are often small-scale (Cuban 2013), seldom sustainable (Toh 2016) and often use ICT to replicate existing practices in school (Glover et al. 2016) rather than to drive innovation. Earlier research has revealed several challenges. Islam and Grönlund (2016), for example, identified several implementation issues in education including contextual knowledge, teachers’ professional development, sustainability, monitoring, evaluation and leadership. Kafyulilo et al. (2016) found that integration of technological tools with the aim of developing traditional teaching practices into a continuation of ICT use and sustainable change is dependent on both support and engagement from the school management. Sustainable implementation of new pedagogical methods is difficult, especially if the initial champion is no longer in place (Hattie 2009). Five years is found to be a critical survival time in this respect (Borman et al. 2003) and ICTs adoption is most effective when closely linked to clear pedagogical objectives formulated within an overarching framework where focus is on pedagogical rather than technological issues (Petko et al. 2015). Agélii Genlott and Grönlund (2016) showed that ICT use without integration with a pedagogical method can yield worse results than not using ICT at all. This means that it is important to develop and disseminate effective innovative methods with the goal to make them a standard practice. ICT integration in education needs to be scaffolded by various means that involve actors at different levels. One of these actors are teachers. Digital technologies are protean and present fundamental challenges for teachers trying to integrate them into their teaching. Thus, understanding the relevant technologies’ affordances and constraints requires teachers’ professional development (Koehler and Mishra 2009). Successful professional development and educational change among teachers has shown to be dependent on both individual and collective capacity. According to Stoll et al. (2006) capacity refers to a complex mix of motivation, skill, positive learning, organizational conditions and culture as well as infrastructure of support. Organized professional social systems, sometimes called Professional Learning Communities (PLC), are based on these capacities and let people in an ongoing process collaboratively and critically analyze their practice in a professional learning-oriented way. Many researchers claim the effectiveness of such social systems in promoting teachers learning whilst other raise fundamental questions about how they are organized as well as their purpose and outcomes. According to Philpott and Oates (2016) fundamental questions about PLC relate to what kind of change the social system are aiming to produce and the model of the social system which they are based on. The social and communication structure within a social system, as well as the role of opinion leaders and change agents, can, according to Rogers (2003), either complicate or facilitate the diffusion process. One additional factor within this study is therefore to understand how the social system created for the purpose of the organized teacher development program helps or hinders teachers with different backgrounds achieving second-order-change. Integration also requires activities at school and municipality/district levels (Eickelmann 2011; Petko et al. 2015). The success of innovation depends “on the way changes are managed, especially the balance between leadership and joint participation in the innovation process” (Petko et al. 2015, p. 50). Teachers can develop individually by themselves, but in order to make large-scale use of effective ICT-supported teaching methods there is a need to find ways of disseminating them and leading the change. Principals’ leadership has been shown to have a direct impact on the success of a technology initiative (Beycioglu and Kandukci 2014; Islam and Grönlund 2016). A review by Pettersson (2018) shows that organizational structures in school directly affect the possibility for teachers to adopt and develop new competence, but that most research neglect influences of broader contextual conditions limiting the focus to specific competencies needed by teachers. Researchers have identified several reasons explaining why some teachers integrate ICT in their teaching practice and others do not, with a key distinction between external and internal factors (Eickelmann and Vennemann 2017). Whereas supplementary ICT use often only requires relatively small changes in the pedagogy or organizational strategies, integrated use of ICT places greater demands on classroom culture, teachers’ ways of instructing students, and their adaptability to new conditions (Ertmer et al. 1999; Vanderline et al. 2015). Change requires belief among teachers that the proposed new methods will bring improvements. The most recent Swedish Government investigation (SOU 2014) showed that less than 1/3 of the teachers were positive to integrating ICT in education. Twenty percent felt ICT interferes with their pedagogical work rather than supports it. This leaves us with a double trouble: a need to design pedagogical methods where ICT is effectively integrated and a need for finding effective approaches to disseminating these methods and making them commonly shared practices. The success of ICT in other businesses has been built on considerable process redesign. Such profound changes require second-order change (Brickner 1995; Ertmer 1999). First-order change means adjusting current practice by doing the same things as before but in new ways, such as using a computer as a typewriter. Second-order change redefines the very nature of activities, such as e-government where service users take over tasks related to service application, delivery, and payment from government staff. Marzano et al. (2005), examining the role of school leaders in leading change, defined first-order change as incremental and consistent with current values, and second-order change as innovation-driven, irreversible and requiring fundamental change from current practice. First-order barriers to technology integration, such as lack of digital devices or inadequate technical support, are extrinsic. Second-order barriers are intrinsic and include beliefs about digitalization and traditional classroom practices, as well as the general unwillingness to change which is captured in the saying “if it isn’t broke, don’t fix it”. Adding resources can reduce many first-order barriers but second-order barriers require teachers to challenge their practices as well as their beliefs, which includes how they define teaching and, thereby, learning (Eickelmann and Vennemann 2017). 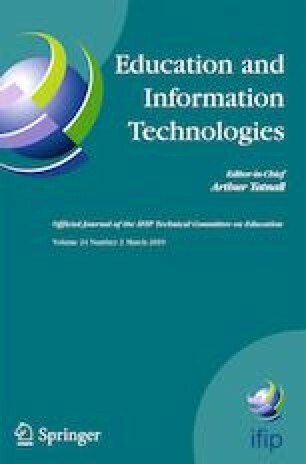 This study aims to understand opportunities and challenges involved in disseminating an ICT-based innovative method, proven to be effective but requiring fundamental changes to traditional methods and beliefs, by asking: How can a pedagogical method that requires integrated ICT-use and second-order change be disseminated? Diffusion of Innovation Theory (Rogers, 1962; 2003) presents crucial factors for dissemination of innovations, including properties of the innovation, the adopters, the communication channels by which the innovation is disseminated, time, and the social system in which the adopter lives and works. The theory has been adopted also in education research to, for example, determine the degree to which institutional strategy, structure, and support decisions facilitate or impede blended learning adoption among faculty (Porter and Graham 2015); to understand pre-service teachers’ perspective of the diffusion of ICTs in elementary education (Sahin 2012), and to understand factors affecting teachers’ adoption of game-based learning in elementary schools (Li and Huang, 2012). Diffusion is the process by which an innovation is communicated through certain channels over time among members of a social system (Rogers, 2003). It is a social change, a process by which alteration occurs in the structure of a social system involving interpersonal communication relationships. The main elements in the diffusion of new ideas are: (1) an innovation (2) communicated through certain channels (3) over time and (4) among members of a social system (Rogers, 2003). Adoption of an innovation depends on three general factors: the innovation itself, the adopters, and the ways in which an innovation is disseminated. An innovation is an idea or a practice perceived as new among the adopters and “the characteristics of an innovation as perceived by the members of a social system determine its rate of adoption” (Rogers, 2003, p. 36). Innovation characteristics include: relative advantage, compatibility, complexity, trialability and observability. Innovations offering a higher degree of these attributes will be adopted faster than other innovations. Relative advantage is the overall strongest predictor of adoption. Communication channels provide means for people to share information about the innovation. Channels can be active (e.g., a course) or passive (e.g., a book). Innovations may be disseminated at different pace among different individuals and different social systems. As social acceptance of change is important for it to happen, there is a need for a critical mass of individuals embracing the new views required for the innovation to take root. This makes it difficult to enforce change; it has to come from within. Diffusion occurs within social systems consisting of individuals engaged in solving a problem or attaining a mutual goal. This common goal, sharing of objectives and cooperation binds the whole social system together. The social structure includes the patterned arrangements that give stability to human behavior in a social system and norms are established to guide behavior patterns for participants in a social system. Adoption of an innovation happens when a person decides to use it, rejection is when s/he decides not to. Reinvention is the degree to which adopters change and modify the innovation during the implementation process. Rogers (2003) suggests that in early diffusion studies, adoption meant the exact use of the innovation, but this has changed as innovations are not always fixed entities but proposals for change. Hence, in the diffusion process, innovation ideas commonly evolve and transform. This is particularly true for innovations which do not require exact technical tools or procedures but allow some degree of freedom, such as teaching. Even though innovation may be reinvented there is a need to understand the point at which it has changed so much that it no longer resembles the original innovation. This is in particular a problem when second-order change is concerned, as it always includes an element of activity which is easily adopted (e.g., typing on a computer) but loses its meaning if the views underlying the change are not adopted. People may adopt the mechanical parts of an innovation without adopting its purposes, theories and evaluation measures. In that case the innovation is lost. The WTL (Write To Learn) method, which improved student performance in national standard tests with some 20 percentage units (Agélii Genlott and Grönlund 2016), draws on a number of learning factors that research has shown to be successful – visible learning (Hattie 2009), the power of feedback (Hattie and Timperley 2007), metacognition and social interaction (Vygotsky 1978), genre and literacy modeling (Rothery 1996), and formative assessment (Black and Wiliam 2003). It uses a combination of ICT tools to effectively implement these factors in teaching and learning practices. WTL is linked to the national curriculum and prescribes social use of ICT. A detailed presentation of WTL can be found in Agélii Genlott and Grönlund (2013, 2016). Since WTL required profound change, the course, Teachers Formative Assessment Learning (TFAL), aiming to disseminate the innovation, was designed by the municipal educational administration. Stretching over one academic year, the course is based on key principles for professional development, focusing on links between the curriculum, teaching activities, analyses and assessment of student outcomes (Timperley et al. 2008). In between course meetings, participants are instructed to continuously share experiences and analyze their work using a predefined model. Based on that model, they provide continuous asynchronous written formative feedback to each other on a digital website. It is an on-the-job course, including teachers from schools across the city, hence forming an extended social system. This cross-sectional study measures the adoption rate of the WTL method by asking if the teachers still Respondents were quite equally distributed used this method and if so, how. A questionnaire was sent to the whole target population, that is all of the 154 teachers who participated in the course any of the years within the period of 2011–2015. A total of 92 teachers from ten schools responded, which gave a response rate of 60%. Respondents were quite equally distributed in terms of year of participation with 17% participating in the course in each of the years 2011, 2014 and 2015, 26% in 2012, and 24% in 2013. This design gave us an opportunity to compare method retention between participants from different years. It is common that innovations become “diluted” over the years, in particular if the innovator leaves, and five years is a critical period for sustaining the implementation of a new pedagogical method (Borman et al. 2003). Data was collected by a means of a questionnaire (Appendix) based on the Diffusion of Innovation theory (Rogers, 2003). Twenty-five questions and statements covered the innovation’s attributes: relative advantage, compatibility, complexity, trialability, and observability. A further 13 statements covered the communication channel. Most items were formulated as statements to which respondents answered using to a 5-point Likert-scale from 1 = Don’t agree to 5 = Fully agree. Some others used a 3-point scale, e.g., “To what extent do you use the method today?” (fully-partially-not at all). Others yet were yes-or-no questions, e.g., “Has your principal in any way actively taken interest in your participation in the course?” Participation in the study was optional and the survey was anonymous. Data was collected online through Survey Monkey. The data collection tools, both the digital forms of SurveyMonkey as well as the questions and likert scales were all pretested on 5 teachers before the survey was conducted so as to make sure all questions were understood as expected. Data was analyzed quantitatively by means of frequency distribution, cross tabulations and correlation tests using Spearman’s rank order correlation. STATA software was used for the data analysis. Some notes on the sample. Considerations concerning the reliability of research studies with respect to the response rate must always be borne in mind. According to Bryman (2016), response rates are declining in many countries. This also goes in line with the Government agency of Statistics Sweden (SCB) that is known to have quite high response rates but still generally ends up around a 40% rate of non-response for house-holds surveys (Nyman and Österman 2016), that is, the same as in this study. This study used a complete sample and the possibility of increasing the sample to include more teachers from the sample frame (e.g teachers within the City that had not participated in the program) would not have been an option since they were not using the WTL method that the study was about. Several reminders were sent, but without response. There was also a time aspect as some of the teachers had taken the course as long as 4 years earlier and were later found to have either moved from the city, changed email-address or been recruited to another school in another city. Was there any reason to believe that the non-respondents would have answered differently than the respondents’? There is of course a risk that the non-respondents would have answered differently but since the majority of them did not refuse but rather were difficult to reach this probably would not have affected the results to a large extent. Still it is of course important to discuss in accordance with the statistical inference from this study. The results are presented by the factors of the Diffusion of Innovation theory. WTL was immediately – the same year as the course was taken – adopted “fully” by 1/3 of the teachers and “partially” by 2/3 (Table 1). Adoption is measured as self-reported use. Eighty out of the 85 teachers who had completed the course, used the method at least partially. Adoption of pedagogic methods is volatile, so retention is critical. Therefore, it is important to measure the use of the method over a period of time. The share of teachers who reported they used the model in 2015 was exactly the same as for those who took the course in 2011 and in 2015 with variation for the years in between (Table 1). There is no trend showing either decline or improvement over the years. 4 = I regularly do this, and I use the analysis and reflection framework provided by the method. A higher score, hence, means not only more frequent use of the method but also more explicit and analytical use. Table 2 shows that the share of regular users giving rates of 3 or 4 is over 50% for four of the goals (1–4), but not for the goals 5 and 6, which concern analysis and reflection and giving students written formative feedback. The top scoring goals (1–3) share the characteristic of being necessary in order to at all use the method. Ignoring any of the goals 2 and 3 will be immediately visible; lessons will run less smoothly. Goal 1 – contributing to collegial learning through written feedback – may not be immediately necessary to do in writing, but sharing experiences is in general common practice in such small schools (a typical primary school size is two parallel 20-student classes each). The third goal - technology integration - can obviously be achieved to a variable extent. A few teachers (12%) do not do it at all, 26% find it difficult (Table 2), but more than 50% do it regularly. In view of the results in Table 1 (and Table 4 below), the ratings of 1 or 2 in Table 2 might indicate a slow start or difficulties in method use rather than rejection or dislike of it. Concerning reinvention, 23% of the respondents stated they had reinvented the method, i.e., made changes that they conceive as improvements (Table 3). The “reinventors’” share is stable over the years. The lower share for 2015 (15%) may be explained by the fact that these teachers responded to our questionnaire just after they had taken the course. This means they had not yet had the time to gain enough experience in using the method to have started thinking of improvements. The question of what they have reinvented is not straight-forward to answer as “improvement” can be subjective. However, higher (self-rated) progress towards the goals was correlated to the score on innovation properties (rs = .4058,p = .0005). In other words, those who liked the method more rated their own progress towards the goals higher than others. Respondents’ views of WTL qualities were overall positive. Most factors scored at 4 or above on the 5-point scale and were stable over the years (Table 4). While the year 2015 course participants rated the method slightly higher, the differences over the years are small; there is no trend of increase or decrease. As for complexity, higher score means lower complexity. The average being over the neutral “3″ means a majority of the teachers did not find it very complex. Complexity was defined in terms of requirements on teachers, “is there a need for broad experience of different pedagogical methods?” (49% thought not), comprehensive digital skills (40% thought so, 14% - not), and fundamental changes compared to current practice (64% opined they had to make major changes). The method hence comes out as moderately demanding in terms of skills and knowledge but challenging as concerns the second – order changes. Still, most teachers did not think the method was complex in terms of classroom use: 44% strongly agreed and 37% agreed that the method “is easy to apply in practice,” and 81% were positive to the statement “The WTL-method is an efficient work method.” This suggests that the course indeed required second-order change; teachers felt that while it was not too difficult technically to implement, it challenged their basic beliefs and current practices. the social arrangements, e.g., a mix of physical and online learning activities. Respondents rated the statements from 1 = completely disagree to 5 = completely agree. Table 5 shows that the ratings of the TFAL course are fairly equal over the years. The social factors were highly ranked: peer-learning (average score = 3.9), interaction arrangements (=4.1) and explicit analyzes of teaching and learning (=4). Participants younger than 30 years appreciated the course more than older participants (Spearman’s rank order correlation test; rs = .-2606, p = .0260). Important characteristics of a social system include social factors, norms, opinion leaders and change agents, i.e., people that influence others. Several social factors at the school level – the immediate social system - were negatively related to teachers’ progress towards course objectives, some of them significantly so: that the principal endorses the use of the method beforehand, colleagues use the model beforehand, the use of the method is rewarded with salary increase, and the method is declared a standard method (Table 6). Respondents who have greater challenges in reaching the course objectives were hence more dependent on the immediate social system. Respondents who had progressed further towards the course goals were less dependent on the immediate social system. Higher progression towards the course objectives was significantly positively correlated to the rating of the extended social system provided by the TFAL course (rs = .4149, p = .0004). Respondents who had come further in implementing the method appreciated the extended social system more. Consistent with responses to the complexity issue (Table 4), we found that user characteristics that significantly correlate positively with progress towards the objectives included digital literacy (rs = .3266, p = .0058) and ability to handle change, defined following Rogers’ categories ranging from “innovator” to “laggard” (rs = .4043, p = .0006). Age correlated negatively with progress towards objectives: the younger the respondent, the more (perceived) progress. Most respondents (93%) rated themselves as “pioneers”. 67% of the 93% also rated themselves as “actively seeking change”, 26% as “adventurous” and 30% as “open to change but not ready to lead” (Table 7). This study aimed to understand the opportunities and challenges involved in disseminating the WTL method. We found a number of factors important for leading educational change. They relate to issues of (1) sustainability, (2) leadership, (3) immediate and extended social systems and (4) handling diversity. The WTL method was promptly, if not always in all detail, adopted by most respondents, and retention was similar over the five years, which is a critical period for sustaining the implementation of a new pedagogical method (Borman et al. 2003). This suggests that large-scale dissemination has succeeded and that the teaching practices prescribed by the course have started to become a de facto standard practice. It is not that all teachers are working in exactly the same way, but a large majority use the method. No teaching method is cast in stone but allows for interpretation and variation, and the fact that people refer to WTL and relate their variations to it suggests it has become if not a strict standard so at least the common reference model. Teaching methods being “soft”, as compared to manufacturing or administrative processes, is not a weakness but a strength. Teachers must be allowed some freedom in their work, both in order to meet different students creatively and so as to maintain and develop their own professionalism. “Sustainability” is therefore better defined as an actively shared practice than strict standard procedures. The method’s survival beyond the critical 5-year period can partly be explained by the innovation factor itself. WTL was seen as more effective than other methods – the overall strongest predictor of adoption of an innovation as of Rogers (2003) – and compatible with the current curriculum and teachers’ proficiency. Successful dissemination also requires activities at school and municipality/district levels (Eickelmann 2011; Petko et al. 2015), as well as motivation and support from the school management (Kafyulilo et al. 2016). The city’s school administration was very proactive and persistent. Not only did they run the course for several years, they also required all principals to endorse, communicate and actively support the effort. They also continuously followed up teachers’ progress, thus showing their continuous and devoted engagement. This way a growing cadre of pro-active teachers has been created in the city, even though the original innovators have left, and even though the method required substantial change on part of the teachers. Social factors are important for dissemination of innovation, but this study shows that different social factors are important to different people. The extended social system provided by the course was appreciated by all participants but most highly ranked by respondents who had made more progress and considered themselves as more innovative. This suggests that teachers who are innovative and inclined to innovate benefitted more from the collaboration within the extended social system of the course. To the contrary, incentives related to the immediate social system of each school were rated higher by respondents who had not come so far towards the goals. Such factors include active principals and supportive colleagues at their own school. Beyond personal factors it seems the “bigger pond” principle may play a role. The social system at each primary school is usually fairly small. A typical school size is two parallel classes in three grades with one teacher in each class. The amount of time available to spend on innovation is limited for any individual, so a larger social system is likely to produce more innovation overall which all can benefit from. An external social system also to some extent frees people from restrictive norms in the home school, which may feel liberating and foster innovative thinking and creativity. And it attracts innovative people who want to extend their knowledge and competence. The TFAL course was designed to support and encourage second-order educational change. This requires participants to be able to widen their horizon and meet different perspectives and disagreements in a productive way to be able to understand the change processes. This is not only an individual endeavor, it requires a vibrant social system of some size. A larger system is necessary not just because schools are small but also because it helps foster and spread ideas, practices and values. As pedagogical methods are less strict, and practice is largely formed by each teacher, dissemination of a method requires building a community of shared thinking around the innovation. Not all respondents achieved all goals, and not all went on to use the method in all its details in their daily practice. For those who achieved less, rewards in the immediate social system at their school were more important while respondents who achieved more valued the extended social system higher. Following Rogers (2003), one explanation for this could be personal factors; second-order change appeals more to innovators and early adopters than to late majority or laggards. Disseminating innovations involves not only teachers learning the method but also them returning to their home school and promoting it to colleagues. This requires a rather convinced early adopter who can also act as a” missionary in her home town”. One passive approach to this diversity problem is, following Rogers, to simply accept that not all course participants will become active ‘missionaries’ and think that after some time, when other more eager adopters have spread the word, the less active will follow. A more active approach is to select course participants strategically so that those who are more likely to not only learn but also actively propagate the method take the course first. An even more active approach would be to adapt the teaching style so as to give the more hesitant participants more support through the course. For example, more people from the same school could take the course simultaneously so that more people would share the implementation and propagation effort. Local factors may suggest which approach, or combination of approaches, to use. However, it is important to relatively fast create a sufficiently large professional community sharing knowledge and views. If this takes too long, attention will likely shift to new ideas. This paper investigates views among teachers themselves about how, and how much, they use the new method they have been taught. It would of course also be interesting to investigate the results of them using the method. One idea for future research is to do that by interviewing school principals, who conduct annual reviews of each teacher’s work based on annual individual plans, and also meet the teachers informally on a daily basis, formally in staff meetings, sometimes visit their classes. Because primary schools are small principals have a good view of each teacher and their work. They could report on any changes in work methods, collegial discussions, ambitions etc. that they have noticed. Another future research idea would be to compare student results with teachers’ level of method adoption. We have already investigated student results on a general level and showed that the method improved results by some 20 percentage units (Agélii Genlott and Grönlund 2016), but we have not measured if there is any correlation between different levels of method implementation. How much is good enough to improve student results? This study aimed to understand the opportunities and challenges involved in disseminating the WTL method, an effective ICT-based innovative method requiring profound – second-order –change in teaching methods and beliefs by asking: How can a pedagogical method that requires integrated ICT-use and second-order-change be disseminated? Sustainability should be thought of not as strict standards but shared point of reference. Teaching methods are “soft”, as compared to manufacturing or administrative processes. This is not a weakness but a strength. Teachers must be allowed some freedom in their work, both in order to meet different students creatively and to maintain and develop their own professionalism. “Sustainability” is therefore better defined as an actively shared practice than strict standard procedures. Creating such shared practice includes two action points: creating an extended social system and handling diversity in terms of individuals’ varying pace in adoption of innovation. Creating an extended social system. A larger system involving many schools is necessary. Schools are typically small and a larger network brings more energy. It also helps foster and spread shared ideas and practices. Handling diversity. Not all people are innovators, but it is important to relatively fast create a sufficiently large professional community who share knowledge and views about the new method. While in-service development, including educational activities, is important for all teachers, to achieve large-scale dissemination it is important to start with those who are not only early adopters but also can actively help spread the word to other teachers. It is important to allow time for change, but it is also important to make sure the network of supporters grows continuously. Undoubtedly the quality of the innovation also matters. One important aspect of dissemination is therefore to make sure to have enough evidence for this quality before embarking on a major dissemination effort. This means school leadership need to engage with research and innovation so as to be able to see the difference between the latest fad and a seed of improved practice. This research was funded by Örebro University. The authors are grateful to the City of Sollentuna for providing the data; to all the principals for providing useful information; to all teachers for participating in the survey; and to Rickard Böö, Örebro University, for handling the data collection and supporting the analyses. Data of the empirical research can be accessed through the educational institution of the City of Sollentuna provided that a required permission from the Ethical Review Board (https://www.epn.se/en/start/) is at hand. This study follows the rules of ethics that involves humans according to the Codex rules and guidelines; http://www.codex.vr.se/en/forskningmanniska.shtml. 1 = “Strongly disagree” to 5 = “Strongly agree”. WTL creates new possibilities for improved teaching thereby being more effective than the methods it supersedes. WTL creates new possibilities for the combination of formative feedback/assessment communicated through digital arenas. WTL (compared to previous methods) creates new possibilities for students to cooperate IRL or virtually. WTL gives a clear structure for the language development within many different subjects. WTL supports the integration of ICT into the pedagogy thereby reinforcing my teaching. WTL requires a lot of new pedagogical knowledge. WTL requires a lot of new digital knowledge. WTL can easily be further developed and extended. WTL can easily be adapted to other pedagogical models and methods. The publication of student work on digital arenas and final feedback from students, teachers and parents has contributed to increased student commitment. * Calculated by summarizing the answers to the statements measuring characteristics of the WTL-model. Presented as a mean value. I think that the written analysis on the TFAL-site has been an important part for my own professional learning. The written feedback on the TFAL-site has given me the opportunity to share thoughts and ideas both with persons very much like me but also with persons thinking differently than me. I know where I can find more information and/or who I can contact for further information about WTL. My work with giving written, formative assessment and feedback on my colleagues´ analyses in the TFAL-course has had great importance for the development of my own teaching practice concerning learning students how to give written formative feedback to each other. I think that after completing the TFAL-course I have enough knowledge to apply the WTL-method into my classroom practice. Research outcomes from results of the WTL-method is important for my decision of adopting or rejecting the method. * Calculated by summarizing the answers to the statements measuring communication channels of the WTL-model. Presented as a mean value. It is important that colleagues from different schools take the TFAL-course at the same time. It is important that the use of the WTL-method is endorsed by the wage-setting boss and linked to salary before I can conceder adopting the method. It is important that the school declares the WTL-method as a standard method before I can conceder adopting it. Beycioglu, K., & Kandukci, Y. (2014). Principal leadership and organizational change in schools: A cross-cultural perspective. Journal of Organisational Change Management, 27(3). https://doi.org/10.1108/JOCM-06-2014-0111. Philpott, C., & Oates, C. J. (2016). Professional learning communities as drivers of educational change – The case of learning rounds. Journal of Educational Change, 2016. https://doi.org/10.1007/s10833-016-9278-4.